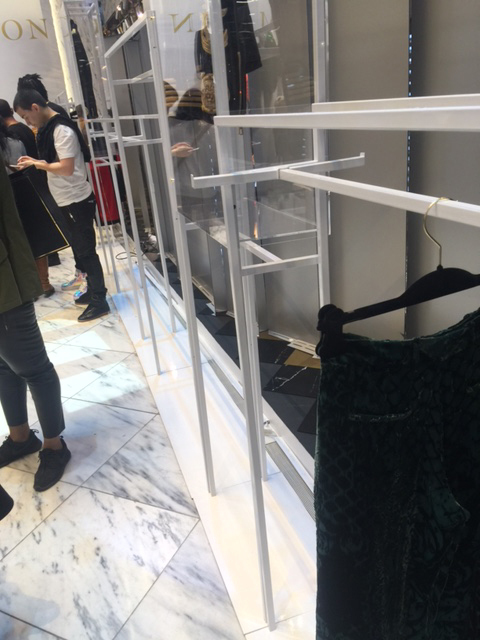 Purefecto: Adventure of trying to buy a piece of H&M Balmain collaboration. 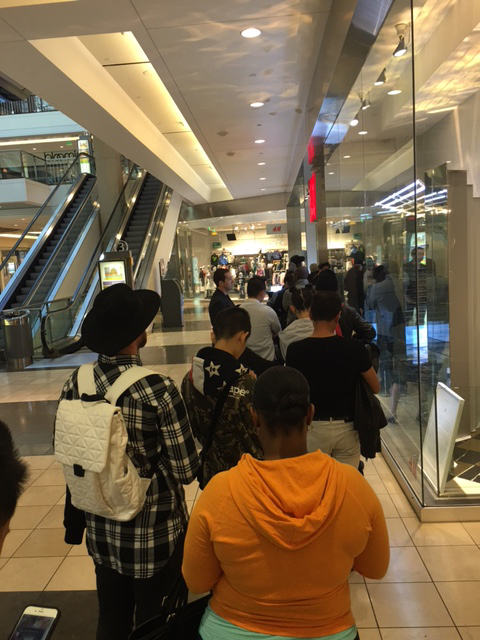 Adventure of trying to buy a piece of H&M Balmain collaboration. Took me awhile to recover from #HMBalmaination craziness. But I finally have the time to document my experience. I knew it was going to be crazy. But I didn't realize it was going to be this crazy. After reading the disaster Hermes sample sale in NYC few weeks ago on Racked NY, I decided the smartest way to get something from this collection was to hire a line sitter. In the mean time, a friend of mine got in the press line in NYC and was suppose to go the night before the launch to pick up a thing or two. He had promised me to get a leather hoodie in L or leather jogger in L for me. I thought about cancelling my line sitter but thought I should just double down. 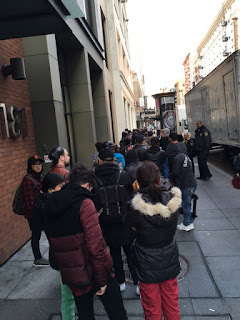 Around 3PM on November 4th Pacific time, I got a text from my friend saying the line is insane!!! I was like but I thought you were in VIP line! Are you sure you are not in the regular line for tomorrow? He assured me he was in the right line and that it was insane. Then a little bit later, he texted me a picture of empty racks.... That was a bust. Well, at least I have the option of getting something online and thank god I did not cancel my line sitter. I decided to go to my local H&M to see how long the line is. This was 8:30 Pacific time. I would say there were about 30 people in line. I was getting a little bit nervous. I thought about calling my line sitter to come early as she was suppose to come around 1AM to wait inline on my behalf. I also thought about maybe I should get in line now and wait for her to show up at 1AM. But then I thought maybe I'm getting too carry away and this is kinda crazy. So I just figure the ones there are die hard ones and I doubt more will show up until maybe 3 or 4AM. So I didn't bother to call my line sitter. I went to H&M around 6:30AM as I know most likely bracelets will be handed out around 7 and I want to be there to get the bracelet on my wrist than to have my line sitter wearing my bracelet. So when I got there, I realized that I was like 100 people back from the front door. I knew it was going to be an uphill battle to get anything from then on. But since I already spent the money to have a line sitter waiting, I might as well wait. By 7AM, they started to give out bracelets. My time slot was 9:45AM. The lady behind me kept on saying "it's all dudes in front of us". She was absolutely correct, it was like 95% dudes and 5% girls so I knew men's stuff would most likely be gone by the time I got in. Finally my time slot was let in at 9:45AM. I was exhausted having wait in line since 6:30 and obviously up since 4AM to try to get online to buy. I think I may have gotten 2-3 hours of sleep. I was the last third or fourth person in my group and they had all of us in a single file line so by the time I got to the men's section, there were several black tank tops, few henley, and couple long sleeve t-shirts left. I was pretty irked by then as there really wasn't anything I wanted to buy. But of course I purchased few obligated items since I didn't come all the way to here to leave empty handed. So I got a tank top, couple small blue leather bags for gifts, couple sunglasses. And for the ladies section, there were plenty of selection except the most desirable beaded items. I got home and checked Ebay...of course all the East Coast stuff are already posted online for sale. I was annoyed to say the least and knowing that the closest I'll get to buy that black leather jacket I want is to either buy the real thing and not eat for several month or pay an Ebay reseller. November 6th, I read on Racked SF the night before that they will be selling the clothes on the mannequin on the first come first serve basis. I thought this will be my only chance to get something. I knew the mall wasn't going to open until 10AM so I figure I'll go there around 9:30AM and see if I can find a way to get to H&M first. I got to the parking lot and went straight across the street. The door was open to several elevators (which goes to the theater/ spa level). I guess some people want to use spa early so the backside of the mall is actually open to allow people to go to the spa. I thought I was pretty smart to get into the building early. 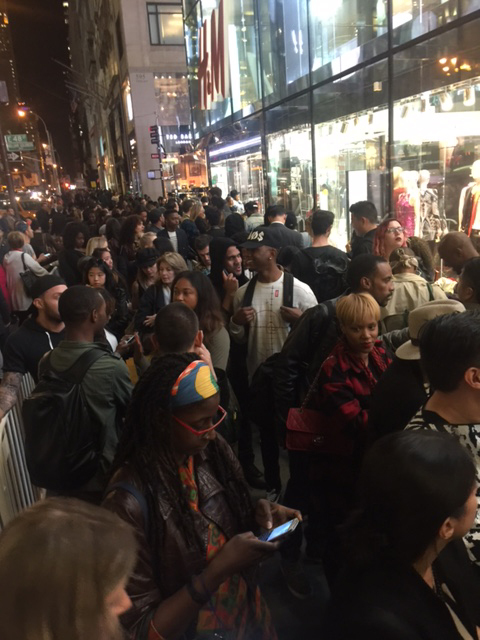 But by the time I got to H&M, there were already 15 people in front of me!!!! Ok... let's see what will be left by the time I get to the front counter.... Then by 10AM, mall door opened and a group of people rushed to H&M. They were all shocked to see us waiting in line!!! They thought they were the first ones! Of course by the time I got to the front counter, there were only one henley left which I could have gotten yesterday. I decided to buy it anyway as I couldn't leave empty handed!!!! Feeling dejected, I thought I would never get my hand on the pieces I want. Then by 4:00PM, I decided to pay up on Ebay for the black leather jacket I really wanted. The seller had zero feedback and actually lives in Oakland. He/she also had several other men's pieces. There were very few people bidding on the jacket and I ended up winning. I guess people just didn't like to buy from sellers with zero feedback. I figured I could either pay with paypal or in person so I would be protected. I tried to pay with paypal and Ebay informs me that I need to get in contact with the seller as that option somehow wasn't working (and seller indicated that he/she takes Paypal). I never encounter that before. So I message the seller and told him/her the paypal thing isn't working and I'm happy to come to Oakland to pay in cash or meet up in SF. Never heard a single peep from the seller. 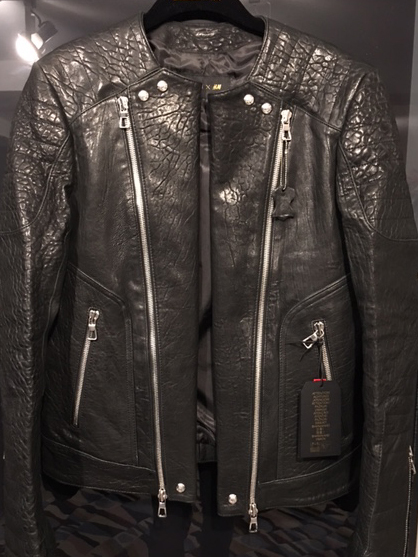 In the same afternoon around 4:45PM, a friend of mine messaged me saying she saw a black leather jacket at the Stonestown H&M!!! I was like excuse me?!!!! She put it on hold for me and let's just say I never got to Stonestown that fast!!! 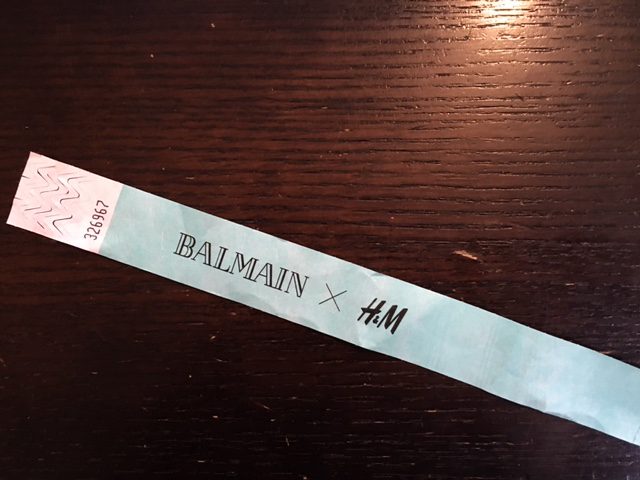 This particular H&M does not carry Balmain so must be someone who bought it at Powell and decided to return. I was very surprised to see it though as he/she could have easily doubled his/her money on Ebay or Craigslist and I'm sure he/she was there waiting in line around 8:30PM the night before launch. Anyway, I'm not complaining! So glad I didn't ended up buying from Ebay (a week later and seller still has not messaged me so I sure ain't gonna contact the seller). While the jacket is a tad tight on my arms, I'm soooo thrill to have it. It was my most wanted item from this collection. I'm sooo lucky to get it. Hope you are as lucky as me! Glad you got your jacket after all that! Tea time! Marc Newson style.